# 30 in our Waikiki map. Hotel Name: .... Kuhio Banyan. 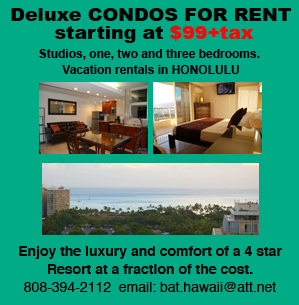 Address: ......... 2310 Kuhio Ave.
for the best deal for a Waikiki Hotel of similar quality. The Kuhio Banyan is more a condo than a Hotel and it is located in the very center of Waikiki. The original design was for a residential building with some shops in the ground floor. The property however was eventually developed into a time share ownership with a quasi hotel operation in place for those units that are unoccupied by their owners at any given time. This hotel is number "30" within the red zone of our Waikiki map, click here to see it's location in relation to other hotels in Waikiki. When it comes to location, being across the street form the International Market Place is a great advantage for this property. All units have a cooking facilities. Despite being only a few floors high, this property has an elevator. Front desk personnel is helpful and friendly. 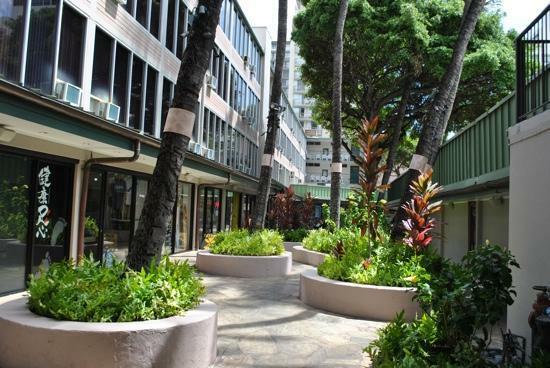 No pool or other amenities and even though parking is available for customers (fee applies like all hotels in Waikiki), it is not within the building. The units are very small that have no "real" beds. There is a fall down Murphy bed and a sofabed. Units have windows but not balconies, more suitable for an office than a hotel. The area is somewhat "seedy". Even though the building can be accessed 24/7, front office ours are from 7am to 11PM so for those that need to check in on arrival day after the closing time, special arrangements must be made in advance so keys can be left with security, no previous arrangement, no key. This is not a secured building. Because it is a condo operation, the security deposit is higher than a hotel operation ($250.00, the security deposit is meant to cover any damage to the unit and is normally refunded the day of departure). Please keep in mind that ALL Hotels have shortcomings, the trick is to find a hotel which shortcomings you do not mind. This hotel may or may not be the best option for it's category considering your particular situation and the days that you plan to visit our islands. Call (808) 394-2112 to talk to one of our agents and he or she will be able to find for you the best option based on your needs.